I sit here on Earth, as I contemplate the contributions of great Scientist, Prof. Stephen Hawking. He is now one with The Force. He helped unravel a lot of mysteries of the Universe. Newton told you that two bodies with mass attract each other with a force proportional to their masses and inversely proportional to the square of the distance between them. This is called gravitational force. In 1915, Einstein in his revolutionary general theory of relativity considered spacetime as a fabric. Massive objects bend the spacetime to create curved spacetime. The objects just follow the shortest path in this curved space-time (called geodesics). The observable effect is as if they are pulled towards each other. This is the gravitational force. More massive the object, more curved the spacetime, more mutual pull. You might be thinking, who knows if this spacetime fabric exists or is it a figment of imagination, which just provides accurate results? You earthlings have developed a great deal of knowledge of ways of the Force! I was pleased that you awarded Nobel Prize in 2017 for observation of gravitational waves. LIGO (Laser Interferometer Gravitional-wave Observatory) is a large scale Physics experiment that conclusively proved Einstein’s theory by detecting the ripples in spacetime formed by collisions of massive objects billions of years ago! It continues to study such phenomena and its data will bring more information about the theory of gravitation and astrophysical phenomena for many exciting years to come. Imagine spacetime fabric where a infinitely small and infinitely dense, but finite and very heavy mass is placed. This actually creates a singularity in spacetime! You might be wondering how such black holes can form in our Universe. In the night, you see shining stars. The stars are actually huge nuclear fusion reactors, constantly burning fuel and shining. Your sun is one of them. This energy prevents the star from collapsing due to gravity of its own mass. When the fuel starts running out. The star starts collapsing on itself due to gravitational force of its mass and starts increasing in density. If star is massive enough, it will keep collapsing and eventually end up in a black hole, zero size and infinite density! (S. Chandrashekhar showed that the required mass is 1.44 times the mass of sun). Why we care about Black holes, you ask? Black holes contain the key to the theory of everything! It is a situation where extreme gravity operates at smallest of length scales, where rules of quantum mechanics dominate. Till date, there is no theory combining both gravity and quantum mechanics. A unified theory of quantum gravity is a longtime dream of everyone in the Universe! When the Universe began with a Big Bang, the situations were similar, extreme mass leading to extreme gravity and tiniest of length scales of baby Universe! Understanding black holes contributes to understanding of where we come from! This is the glorious goal Stephen Hawking worked towards and contributed a lot! Do you know about entropy? Entropy is a measure of disorder. The way of The Force in the Universe dictates that the total disorder, total entropy of The Universe always increases. This is the second law of thermodynamics. The third law of thermodynamics states that an object must have zero entropy at the minimum temperature possible, the absolute zero temperature. Black holes, like objects at absolute zero temperature, were supposed to contain zero entropy! But Bekenstein, a Physicist, proposed that if that were so, you can throw matter in the Black hole, and since no information from Black hole can come out, it amounts to decreasing the entropy of the Universe, violating the second law of thermodynamics. Hence Black holes must have entropy! where A is the area of the event horizon, calculated as , k is Boltzmann constant, and lp is the Planck length. This is often referred to as the Bekenstein–Hawking formula. is “black hole” or “Bekenstein–Hawking” entropy. Notice one peculiarity of the formula. Entropy is an extensive quantity which means that entropy should scale with volume. Here, the entropy actually scales with area! This has led Physicists t’Hooft and Susskind to propose so called holographic principle which states that anything that happens in a volume of spacetime can be explained by data only on the surface of that volume. This is like the plastic holograms you play with, the 2D surface showing a 3D image by encoding all its information. This idea has been very fruitful in the journey towards quantum gravity. If an object has an entropy, it should be at a finite temperature! (as we mentioned, objects at zero temperature only can have zero entropy) This temperature is called Hawking temperature. Now if an object is at a finite temperature, it must radiate energy! This is called Hawking radiation, and this was a breakthrough in our understanding of black holes. Hawking from his path breaking work has given birth to new challenges, thus new possibilities in Physics. Some of which are still unsolved and providing motivation and excitement to everyone! Coming generations will also be working on these problems and continuing his great legacy to understand The Universe. No information can come out from the black hole. So one cannot retrieve information about what matter fell into the black hole. This was fine if black holes lived forever because even though we cannot get the information from outside it exists inside and represented in event horizon by holographic principle. But if Hawking radiation occurs, the black hole loses its mass slowly and black holes evaporate away. (though on a gigantic time scale of the age of Universe itself!). This will lead to loss of information! Loss of information in such a way is not allowed, as it violates a sacred principle of conservation of probabilities in quantum mechanics. This led to famous Thorne-Hawking-Preskill bet. Where John Preskill bet Kip Thorne and Stephen Hawking that the information cannot be lost and the description of black hole needs modification, while Thorne and Hawking stand their ground that quantum mechanics rules need modification and the information radiated is essentially “new”. Hawking though, in 2008 conceded the bet when he came up with a theory that black holes might leak the information within them as they die, hence total information is indeed conserved. But the community has not agreed on the settlement yet and Kip Thorne has not yet yielded. Another problem which has occurred with the concept of Hawking radiation is related to “monogamy of entanglement”. Entanglement is a property of quantum systems, where two subsystems of a single system are related and actions on one affect another. Monogamy of entanglement states that quantum system cannot be fully entangled with two independent quantum systems at the same time. Don Page and Leonard Susskind have shown that particles in Hawking radiation in past are entangled with the particles in Hawking radiation in the present. Also since the Hawking radiation is created by a particle-antiparticle pair which are always entangled. The particle coming out as radiation is thus: entangled with past particles coming out as radiation and with the anti-particle falling in. This is not allowed! To resolve this paradox, one needs to give up one of the three: Einstein’s principle of equivalence (Physics is consistent, no matter which frame its viewed from), unitarity (conservation of probabilities in quantum mechanics) or quantum field theory! One solution which lets go of Einstein’s equivalence, is that there is a firewall at the event horizon, which destroys any incoming particle (not outgoing, hence breaks equivalence)! So entanglement is only with the particles radiated at past and monogamy is maintained. Recent initial data analysis from LIGO as shown signatures that event horizons may not be sharp but fuzzy, or like fireball destroying particles! 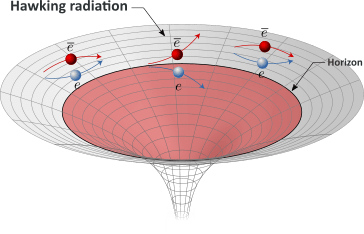 It will be interesting if LIGO, the experiment which proved Einstein’s general theory so conclusively by observing ripples in spacetime, also pokes a hole in one of its basic tenets! Though more analysis is needed to confirm this, these is exciting times to be alive for you! People like Hawking have spent their lives uncovering the details of the Universe and the ways of the Force. In particular, he had so many challenges in his life, with his physical condition, but he still defeated them with the Force within. He will be forever remembered in the Universe for his contributions and continue to inspire. Hawking, S. W. (1971). “Gravitational Radiation from Colliding Black Holes”. Physical Review Letters. 26 (21): 1344–1346.doi:10.1103/PhysRevLett.26.1344. How is particle energy? Recall Einstein!